The Christmas ham that we bought for Christmas dinner after the fact is almost gone so I googled “Ham Bone Soup” and this recipe came up from allrecipes.com and all the reviews were good so I thought I’d give it a try and it was good and easy! 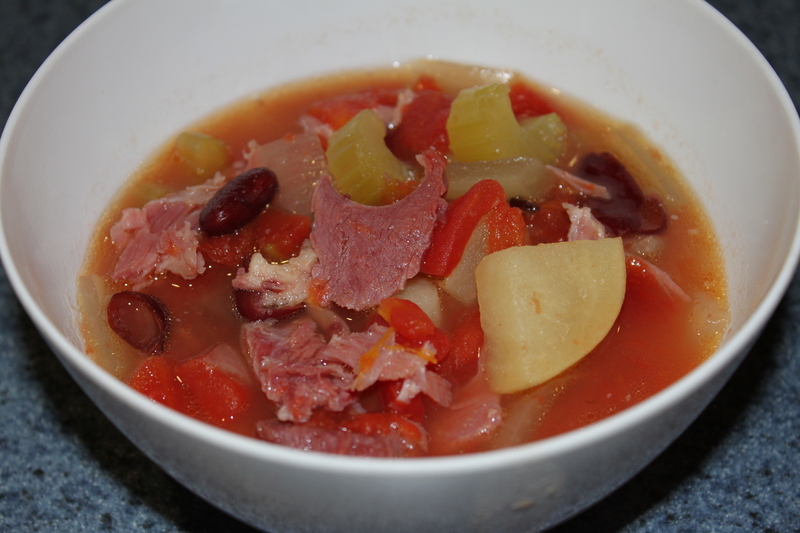 1 Place ham bone, onion, tomatoes, kidney beans, potatoes and green pepper (and whatever else you want to add) into a large crock pot. Dissolve the bouillon cubes in water and pour into slow cooker (or just add cans of chicken broth). A note from me – when the soup was done, I took the ham bone out (which was really meaty) and pulled all the ham off of it (it came right off after cooking for so long) and chopped it up and dumped it back in the soup.